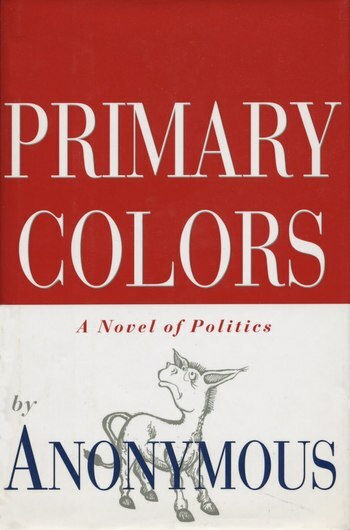 Primary Colors is a Roman à Clef novel published in 1996 and attributed to an Anonymous Author (later revealed as journalist Joe Klein), as well as its 1998 film adaptation. The film was directed by Mike Nichols, with a screenplay by Elaine May. The main stars were John Travolta, Emma Thompson, Billy Bob Thornton, Kathy Bates, and Adrian Lester. Both works are inspired by the 1992 presidential campaign of Bill Clinton. Henry Burton (Lester) is the campaign manager for Jack Stanton (Travolta), a charismatic but flawed governor whose philandering ways begin to affect his presidential campaign. Stanton's wife Susan (Thompson) is in some ways the driving force of the campaign and the mediator between the figures involved. Richard Jemmons (Thornton) is the campaign's lead strategist of this campaign, while Libby Holden (Bates), the media consultant, an outspoken lesbian who has been tasked with nullifying the potent threat of negative media reporting. She is the source of much of the verbal humor of the film. The characters are, at least in part, based on real figures. Stanton stands for Clinton himself. Susan stands for Hillary Rodham Clinton. Burton is based on George Stephanopoulos, though the real figure shared duties with James Carville and David Wilhelm. Jemmons stands for Carville himself. Holden is thought to be a Composite Character which combines Betsey Wright and Vince Foster. Wright is credited with establishing the rapid response system that was responsible for defending Clinton's record in Arkansas and promptly answering all personal attacks on the candidate, while Foster was a highly-regarded lawyer and a close confidant of Hillary best known for his highly-publicized 1993 suicide. The film was not a commercial hit. Its worldwide gross is estimated to $52,090,187, meaning it failed to even cover its budget. About $39 million came from the U.S. market, where it was the 54th most successful film of its year. However, it was a critical hit and remains a well- respected film. It has been praised as "a savvy and thought-provoking look at the nature of contemporary American politics" and as successfully straddling "the line between comedy and tragedy". However, there have also been criticisms that it failed to capture the humor of the novel. May was nominated for an Academy Award for "Best Screenplay Based on Material from Another Medium". She lost to Bill Condons of Gods and Monsters. Bates was nominated for an Academy Award for Best Actress in a Supporting Role, but lost to Judi Dench of Shakespeare in Love. The Film of the Book: An epilogue of sorts is added to the movie where we see Jack Stanton won both the primary and the presidential election that was not in the book. No Celebrities Were Harmed: The novel is about the presidential campaign of governor Jack Stanton, who is rather obviously modeled after Bill Clinton. Many other characters in the novel also have real life counterparts. Roman à Clef: The novel belongs to this genre. Supporting Protagonist: Henry Burton may be the protagonist, but Jack Stanton is the center of attention. 20 Minutes into the Past: Set in 1992, released in 1998. What the Hell, Hero? : When the Stantons decide to leak Fred Picker's drug use and affair with Lorenzo Delgado to the media, Libby has an emotional meltdown, culminating in her committing suicide.